Step 5: Set up a PIN or password for your device’s screen lock. You’ll need to enter this PIN or password to unlock your device when you turn on its display. 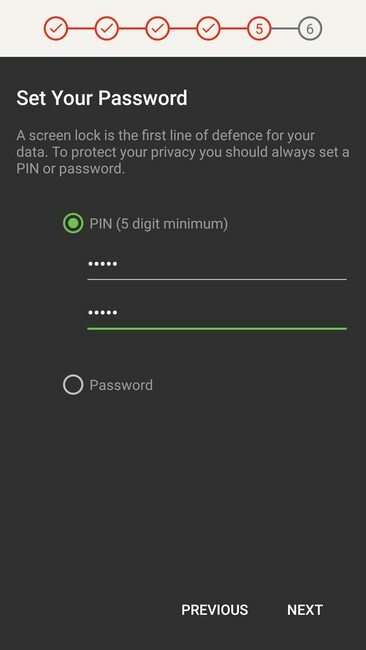 Choose a PIN or Password to protect your device. If you decide to use a PIN, Blackphone requires a minimum of 5 digits. Note: Blackphone automatically encrypts your data by default. When you set a screen lock PIN or Password, it will also become your decryption PIN or Password — you will enter it when your phone boots up to decrypt your device storage. However, Blackphone also supports setting up separate decryption and screen lock codes. Please see ”Encryption Password” for more information.